New BC NDP Premier John Horgan, right, with BC Green Party leader Andrew Weaver. Photo: BC NDP. Congratulations to John Horgan, NDP leader and new premier of British Columbia. The Liberal government of Christy Clark lost a non-confidence motion Thursday and Lt.-Gov. Judith Guichon invited Horgan, backed by Green Party leader Andrew Weaver, for form a government. Energy issues don’t appear to be at the top of Horgan’s priority list, but they are contentious in BC and will command his attention nonetheless. What are those issues and how might a BC NDP minority government approach them? 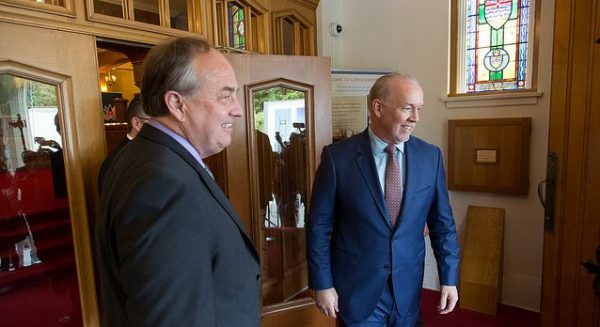 A guide to Horgan’s approach will be his party’s commitment to implementing the full 32 recommendations from the Clark-appointed Climate Leadership Team, whose report was submitted in late 2015 but ignored by the Liberals when the provincial climate change plan was updated in mid-2016. Some of the team’s recommendations are pragmatic and should be implemented. Some are based on eco-activist fantasies – my favourite is the zeal for California’s Zero Emission Vehicle program, which currently lies in shambles – that should be ignored. 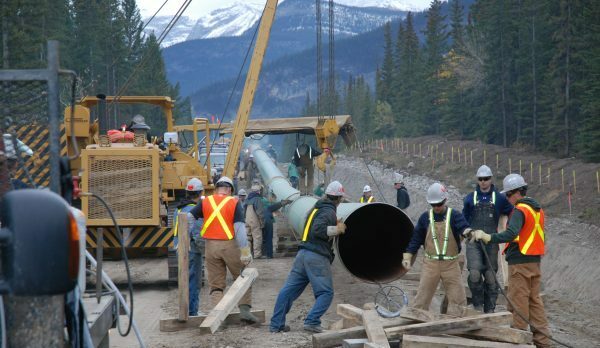 Trans Mountain Expansion pipeline – Regardless of Horgan and Weaver’s other priorities, the Kinder Morgan pipeline will command their attention this fall. The project is financed, has all the necessary federal approvals, and the company plans to fire up the bulldozers in just a few months. 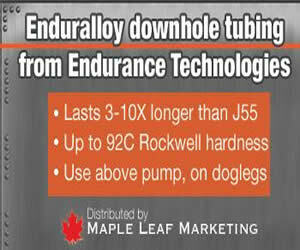 “In March 2017, Trans Mountain re-confirmed its strong commercial support for the Project and is pleased to have all available long-term firm service capacity contracted with a diverse group of 13 customers,” Ali Hounsell, Trans Mountain Expansion Project spokesperson, said in an email. Expect War of the Woods the Sequel when protests start. A best guess from a moderate anti-pipeline group is that about half of young Vancouver activists might be prepared to commit violence to stop construction. Even among believers in civil disobedience, there are plenty willing to go to jail for the cause. Opponents, especially First Nations, are linked to the Standing Rock/Dakota Access pipeline protesters, who crowd-funded as much as much as $1.5 million a day to support a 5,000 person protest camp in rural North Dakota. Those hard fought lessons will be shared with their British Columbia allies. Climate Direct Action activists. Climate Direct Action photo. And let’s not forget Climate Direct Action, a US West Coast-based group that tampered with valves on five pipelines carrying oil sands crude. Tote up the scorecard and a nasty, protracted, and probably violent clash seems most likely. Premier Horgan won’t actively encourage the extreme activists, but his government’s rhetoric, as well as its legal and political opposition, will do nothing to dampen the fires. Liquefied Natural Gas (LNG) – Horgan landed in hot water with his labour allies in 2016 for opposing the Pacific Northwest LNG proposal without first running his position by the unions, which naturally are interested in the construction and operating jobs. The NDP leader indicated he would look at ways to change his party’s opposition to support, so there are pressures within the NDP to back the industry. Artist rendering of Pacific NorthWest LNG. But the biggest problem both Horgan and Weaver have with building out an LNG industry is growing greenhouse gas emissions. The Climate Leadership Team’s report is instructive on that point. It recommended electrifying both natural gas production, most of which takes place in the northeastern part of the province, and LNG plants. “The modelling and stakeholder information demonstrates the potential for substantial improvements by increasing the use of existing technologies and practices such as electric drive technologies, energy efficiency improvements, carbon capture and storage, and reduced methane leaks,” the report said. 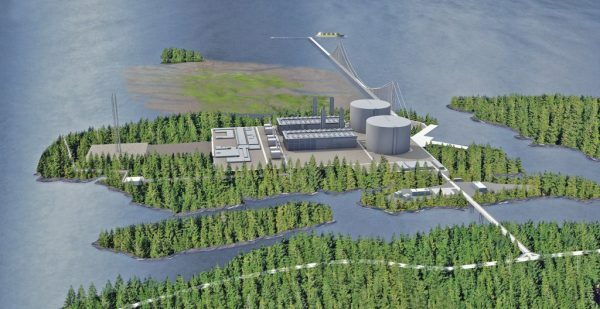 LNG investment in BC is limited to one small plant (Woodfibre near Squamish) and one small retrofit of an existing facility (FortisBC), but if Horgan decides to continue pursuing LNG, he has the Climate Leadership Team recommendations to fall back on. If he chooses, he can also follow the path blazed in Alberta, where NDP Premier Rachel Notley is working with oil sands producers to significantly lower the carbon-intensity of oil sands crude. Horgan could find worse models to emulate. Hydraulic Fracturing – During the run up to the May election, Horgan called for a “science-based review” of fracking. He is concerned about the “the massive amount of seismic activity” and the large volumes of water required for fracking. Promises of a science-based fracking review have been used in the Maritimes as cover to enact a moratorium, though Horgan told Postmedia a ban isn’t practical given that a million people in the lower mainland use natural gas for cooking and heating. As to the science, the BC Oil and Gas Commission completed two comprehensive studies on fracking and induced seismicity and there are plenty of studies from Alberta and the United States that underpin progressive regulations that are already reducing the small earthquakes caused by the practice. The water issue is a concern, but industry has been very innovative in the past few years to reduce water use and to use underground sour water rather than fresh surface water from rivers and lakes. If Horgan sticks to his promise to base government decisions on the science, fracking will continue in the Montney basin, one of the largest natural gas reserves in the world. 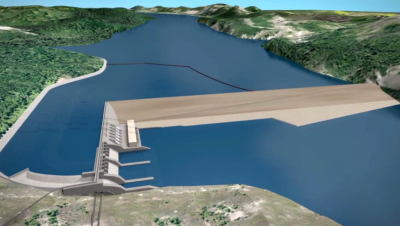 Site C hydro power dam artist’s rendering. Site C dam – The $8 billion BC Hydro project in the Peace River Valley, already well under way, became an election football, especially after a dubious UBC anti-Site C “study” was released two weeks before start of the election. Such a move would probably kill the project, but that might not be the worst thing for the province’s power system. Paul Kariya, executive director of Clean Energy BC, says his private industry members are prepared to build enough wind, solar, and run-of-river projects to replace the 1.1 gigawatts expected from Site C. Those members include BC First Nations, which are eager to invest in renewable energy projects as part of their job creation and economic development strategies. So, what are we to make of a Horgan government in British Columbia? Under the NDP, the BC government will harass and hound Kinder Morgan, but the constitutional jurisdiction is clearly the Canadian governments and Prime Minister Justin Trudeau has promised to back the project, as I have reported in numerous columns. Conclusion: Trans Mountain Expansion is a slam dunk. A messy, politically costly slam dunk for the federal Liberals, but the pipeline will be built. LNG development is dictated by global markets and prices, which at the moment aren’t encouraging. Not to mention that Canada’s competitors, especially the United States, are moving aggressively to build new liquefaction capacity. If that trend continues, LNG may never become the issue for Horgan that it did for Clark. Conclusion: This issue won’t play a big role in the short-term. As energy economist Jennifer Winter explains, “These are slow-moving industries because of the cost that it takes to build a liquefaction facility and so there’s a lot of in-depth analysis to make sure that it is the right decision for companies,” and not much will happen over the next five to 10 years. Horgan will commission a study to review the science, which effectively takes fracking out of the political arena for months, if not a year or two. 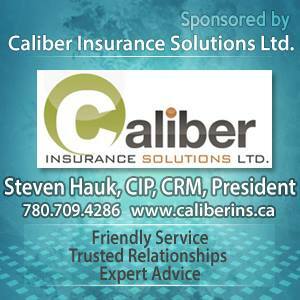 The new premier has enough on his plate, he doesn’t need this issue causing problems in the short-term. Conclusion: A non-issue until the fracking review is completed. As much as the Alberta-based energy industry is shuddering at the prospect of an NDP government in Victoria, the Trans Mountain Expansion pipeline is a slam dunk, LNG investment will be mostly driven by global markets rather than provincial policy, and Horgan won’t want to deal with fracking while he’s tackling much higher priorities, like electoral reform and education funding. The Calgary Bubble can take a deep breath and relax – at least until Sept. or Oct. when the fight over the Kinder Morgan pipeline begins in earnest. 1 Comment on "Horgan and NDP in, Clark and Liberals out – what’s next for energy in British Columbia?"